These are the wireless noise-canceling cans you've been waiting for. Sony's WH-1000XM3 headphones are the sort of dream gadget I can review succinctly in one sentence: They're incredibly comfortable, and they sound amazing. That's it. End review. 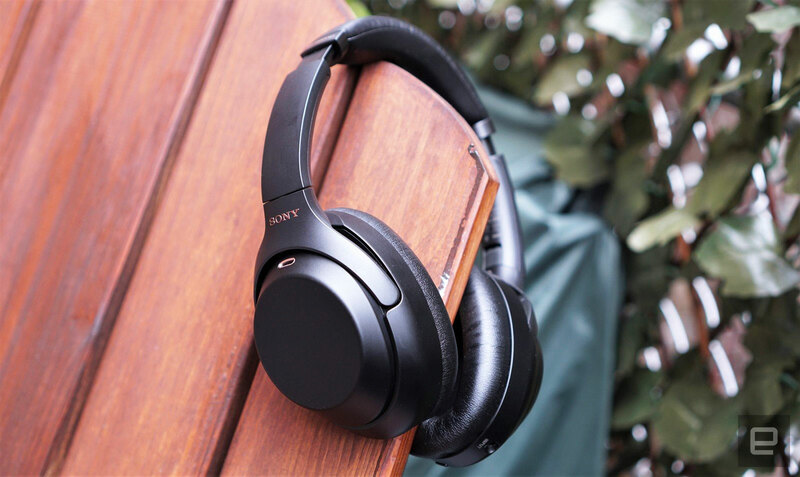 When the first 1000XM pair debuted in 2016, they weren't just another set of premium cans -- they were a sign that Sony was ready to take on Bose for the high-end noise-canceling crown. The company managed to deliver something that sounded better than Bose's best headsets while matching them at their own game. Now, with its third version, Sony is giving us little reason to look elsewhere. The $350 WH-1000XM3s are basically the ideal pair of wireless noise-canceling headphones. How would you rate the WH-1000XM3? Sony's biggest upgrade for the WH-1000XM3 is a new noise-canceling chip, the QN1. The company claims it's four times better than the previous model at reducing external sound. Sony previously integrated noise canceling into the headphones' DAC, but the QN1 is a completely standalone chip. That separation also gives each of the components more room to work without getting in the way of the others. It's also why Sony is able to deliver 32-bit audio processing with the 1000XM3. While that won't make a huge difference for typical compressed music files, it should console people dedicated to their lossless tracks. The headphones also support the LDAC codec, which has three times the bandwidth of Bluetooth, but so far it's compatible only with premium Android phones and Sony's music devices. There's something almost magical about a great pair of headphones -- they make music come alive, no matter what you're playing. The 1000XM3s are simply fun to listen to, with a healthy dose of thumping bass and sparkling clarity in the mid- and high range. They're definitely not neutral headphones, which many audiophiles prefer. Instead, the WH-1000XM3s are loaded with personality -- it doesn't matter that the bass is sometimes overbearing. Dare I say it: enjoyment matters more than accuracy. It really didn't matter what I threw at it -- Led Zeppelin's discography, Tan Dun's sweeping and bombastic Crouching Tiger, Hidden Dragon and Hero scores, or Yoko Kanno's classic nineties anime soundtracks (I'll never stop listening to Cowboy Bebop) -- the 1000XM3 proved itself to be one of the best headphones I've encountered. You know you're hearing something special when you can unearth new details in songs you've listened to hundreds of times. There were moments when the 1000XM3's sound stage was so transparent, as if I was listening to a live performance. I had to stop myself from clapping on more than one occasion. I've tested plenty of high-end headphones that sound great but, for one reason or another, are a pain to wear for too long. Sometimes the headbands are too tight, or they end up hurting your ears. But in my dozens of hours wearing the 1000XM3 -- including on most of an eight-hour flight from NYC to Berlin -- I never felt any discomfort. The earcups and headband are pillowy soft, and they're breathable enough to keep my ears from getting sweaty. I also appreciated that these headphones are lighter than the last model -- at times I forgot I was even wearing them. My only complaint is Sony's touch controls on the right earcup. They work decently most of the time, but they occasionally skipped a track when I meant to turn up the volume. What truly pushes the 1000XM3 into must-buy territory is its noise cancellation. In a head-to-head comparison with the previous model, the new headphones managed to block out noticeably more noise from a loudspeaker playing directly in front of me. It wasn't exactly night and day, but it was enough of a difference to tell that Sony isn't kidding about the advantages of its QN1 chip. During that flight to Berlin, the usual loud drone of the airplane cabin turned into a pleasant hum. And once I started playing music and watching in-flight movies, the cabin noise all but disappeared. Similarly, the headphones did a fantastic job during my commute, turning the noisy and crowded subway into a sanctuary of music and podcasts when I closed my eyes. I'm not one of those New Yorkers who enjoys walking around with large headphones, especially noise-canceling cans. Situational awareness is an important thing when you're dodging pedestrians, traffic and the daily surprises of city life. Typically, I just stroll with a pair of wireless earbuds, wearing just the one in my left ear. I felt less anxious moving around town with the 1000XM3, though, since its ambient sound modes did a fantastic job of bringing in outside noise. You can access it by hitting a button on the left ear or by jumping into Sony's Connect mobile app, which lets you adjust how much external sound you let in. There's also a handy option to focus on voices, which is useful if you're wearing the headphones in a noisy office but still need to hear when a colleague is trying to get your attention. And if you don't want to deal with changing the settings constantly, there's Adaptive Sound Control, which tweaks the noise cancellation based on your environment. It usually reduces all noise when you're sitting still but lets in ambient sound once you start walking around. Sony's app also lets you customize the noise cancellation to your ear profile by playing back a series of tones while you're wearing the headphones. And it can also tweak the feature based on your current atmospheric pressure, which should make it work even better on planes. I'll be honest: it's tough to tell if those app tweaks actually improved things. But it was enough of a placebo to make me think the headphones were actually custom-tuned for me. You can also integrate Google Assistant into the 1000XM3 through Sony's app, which turns the noise-canceling button on the side of the left earcup into an Assistant prompt. While the feature works fine, I prefer having sound controls within easy reach. If Sony really wants to go all in with Google Assistant, it should at least have a dedicated button. Sony claims the 1000XM3 gets 30 hours of battery life, and that's not far off from my testing. It survived my flight to Berlin as well as several more days of constant use without needing a recharge. Sony also added a USB-C port for charging, which is convenient if you're already gathering devices supporting that new standard. If you have a well-powered USB-C connection (or Sony's AC adapter), the headphones will have five hours of charge after just 10 minutes. Bose has long been the king of noise-canceling headphones, but Sony has put up a good fight over the years with the 1000XM line. This latest iteration is the knockout punch Sony needs (especially since Bose is still struggling to combine decent noise cancellation with high-quality sound in its headphones). The biggest downside with the 1000XM3 is its $350 price tag. That's the same as Bose's latest QuietComfort, so at least it's competitive. If you want something that's almost as good, though, take a look at Sony's h.ear on 2 headphones. They're not as comfortable as the 1000XM3, but you can find them refurbished for less than $150. Based on its fit and sound quality alone, the WH-1000XM3 is one of the best headphones I've ever used. But the addition of killer noise-canceling integration also makes it one of the most useful pieces of gear you can have. During one particularly busy morning on my Brooklyn block, the 1000XM3 helped me keep my sanity as a semi-truck and a row of cars honked outside my window for half an hour. It didn't completely drown out the noise, but it reduced the truck's horn from ear-piercing to minor nuisance. And once I started playing music, I was able to ignore it entirely. Sometimes it's just nice to have instant quiet on demand.